RogerBlazic.com: What Is LiveGO? And How Do You Make It Stop? A new way to consolidate email and social networks. After writing for several hours, I took a peek at my Facebook account. There was a chat message from a woman I don't know who invited me to check out LiveGO. The link looked harmless, so I clicked on it. I'm always willing to check out new things. I started with one question and shortly had another. 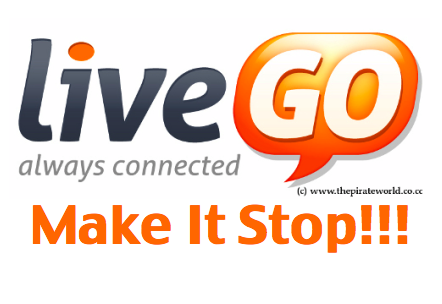 "What is LiveGO? And how do you make it stop?" LiveGO is a platform that allows you to view multiple services at one time, much like Hootsuite, Tweetdeck, iGoogle and others. You can view and use your email from Gmail, Yahoo Mail and a couple other mail services. You can also add your Facebook and Twitter accounts to the multi-window screen, and do instant messaging. LiveGO began in 2010 but its history dates back to 2006, when the developers came up with an Instant Messenger platform - according to their website. As with any new platform, I started clicking around on all the different buttons to see what happens. Windows open and collapse, email gets turned off, Facebook and Twitter stream simultaneously on the same feed. Then, there was the button "INVITE FRIENDS." OK, I'll click on it. It said that 198 of my friends would be invited to use LiveGO. It didn't tell me where these friends were being selected from - Facebook, Twitter, Gmail? It didn't show me a list of who these 198 people were, but I wanted to see what would happen if I clicked "SEND." Within seconds, I started getting IM pop-up windows from people saying, "Thanks, I'll check it out." The problem was, the windows kept popping up, cascading across and down my screen. I even got a thank you IM from the woman that invited me to look at this in the first place. That was odd. But the screens kept coming and coming. About fifteen screens had popped open, I gave up trying to figure out what to do with them. I figured I'd let it go until everyone went to sleep - but it was already 3:45 am and I began to fear the sunrise. Right off the bat, there were some things I did not like about LiveGO. I use Gmail, so I plugged one of my accounts into LiveGO. There was an email which required me to click on a link to confirm my email address for another program where I had changed my email address. The link, however, was all text. It was not a clickable link. I wasn't about to copy and paste the link into my browser. So, strike one. Another thing I didn't care for, and there may be a setting to change this, was that my Twitter and Facebook feed were running on the same stream. I'd get a bunch of tweets, followed by a couple Facebook News Feed items, more tweets, another Facebook News Feed, more tweets. To me, I'd rather have the two separated. Strike two. Then, the screen seemed too cluttered. Even if you collapse the sidebars to get a maximum size screen view, it just seemed like too much. Email on the top, the combined Twitter/Facebook feed on the bottom. Strike three. When you compare it to other platforms, I don't see where LiveGO fits in. If I want to keep an eye on my social networks, Hootsuite looks interesting. However, I need more time to play with it. What's nice about Hootsuite is that you can send an update to up to five locations with the FREE version. I can tweet on my two Twitter accounts, update Facebook and my Facebook Fan Page, Plus, LinkedIN. I can update each individually or all at once. One thing I really didn't like about Hootsuite, was in the Twitter mode, it did not auto-fill my @replies. I may have missed a setting, but being able to quickly add @replies is important to me. For promoting my blog and programming tweets with links in them, Tweetdeck is by far the easiest, fastest way to get that job done. I never bother with the Facebook feed or Google Buzz or any of the other social nets you can program into it. Tweetdeck also takes all of the people I follow on Twitter from both of my accounts and I can easily type in a few letters and select the @replies I want within seconds. You can program tweets and status updates with Hootsuite, but it takes an extra couple steps to add the link, have it shortened and then continue with your tweet. Time for scheduled tweets or updates is programmed with drop-down menus vs. being able to just type in the time as you can with Tweetdeck. To add links to Tweetdeck, you just paste the URL into the update window and it is automatically shortened. Quick and easy. Tweetdeck does something that I can't do with any other tool. Otherwise, I have everything I need by using my browser. I run tabs. And I do them in the same order every time. As a blogger, I need certain tools. I have iGoogle on tab one. On my iGoogle home page, I have a Twitter gadget that is fabulous, a Facebook Gadget, Gmail, Google Calendar, CNN, Google Hot Searches, weather and a clock. On my second tab, Facebook; then Twitter; two tabs for my blogs; a tab for is.gd to shorten URL's; TwitPic, and a blank tab to do Google searches for research or pictures. If I don't feel like I need to jump in or out of Facebook or Twitter, I can use the gadgets in iGoogle. I love them for quick updates. I'm completely satisfied clicking the different tabs and having the full functionality of a program, instead of a truncated version that leaves me wanting features that these new consolidated platforms don't offer. LiveGO looks interesting. It has a nice visual appeal. But it struck out in my book. So, I answered one of my two questions and need to find an answer to the second one before daybreak, "What is LiveGO? And how to I make it stop?" Thanks for the information. I'm always curious to know if there's a better way to monitor and interface with your social network. Think I'll steer clear.